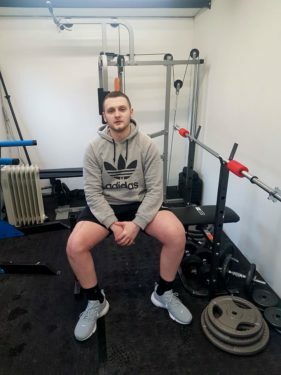 “A big thank you to the Rob George Foundation for giving my son, Jordan, the opportunity to get back into the gym in the comfort of his own home. In October 2016 Jordan discovered he had osteosarcoma in his knee. In March 2017 he underwent limb salvage surgery not knowing if he would come out of surgery with one leg, or two! As you can imagine our whole lives changed. Jordan had to have an extender EPR (extended prosthetic replacement) fitted and learn how to walk again. Jordan never wished for a holiday of a life time. His only dream was to get back in the gym. So dreams do come true and he now has his own gym. The RGF provided us with a grant for all the electrics to be done to make the gym fully functional. So now Jordan and his siblings can walk down the garden to his Man Cave. A nice and warm gym with lighting – we all love it! Jordan is now building his muscle and getting stronger everyday on his leg helping to get his life back on track. Jordan has now gained enough confidence to get back into the gym where we used to go before he became unwell. It’s a lovely thing to know that when bad things happen there are people out there to help get you back to where you once were. Dreams really do come true!